The future orbital trajectories of three spiral galaxies: our Milky Way (blue), Andromeda, also known as M31 (red), and Triangulum, also known as M33 (green). The circle indicates the current position of each galaxy, and their future trajectories have been calculated using data from the second release of ESA's Gaia mission. The Milky Way is shown as an artist's impression, while the images of Andromeda and Triangulum are based on Gaia data. Arrows along the trajectories indicate the estimated direction of each galaxy's motion and their positions, 2.5 billion years into the future, while crosses mark their estimated position in about 4.5 billion years. 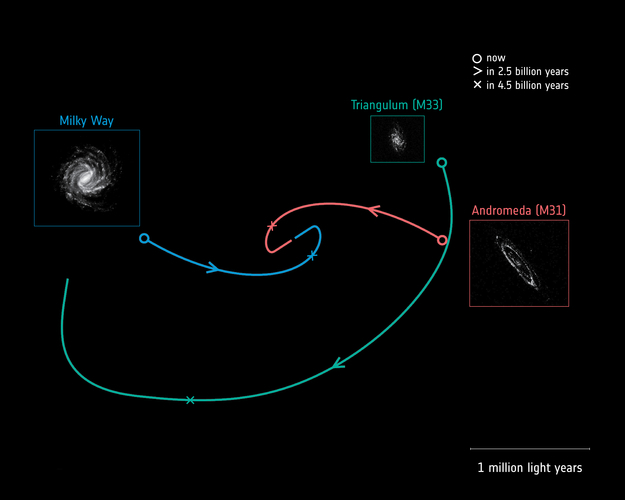 Approximately 4.5 billion years from now, the Milky Way and Andromeda will make their first close passage around one another at a distance of approximately 400 000 light-years. The galaxies will then continue to move closer to one another and eventually merge to form an elliptical galaxy. The linear scale of 1 million light years refers to the galaxy trajectories; the galaxy images are not to scale.